Our world grows more global by the day. You’ll thrive best in that world with a broad understanding of cultural subtleties and practices. When you study a language, you gain skills far beyond the ability to communicate. You develop a cultural awareness that prepares you to live and work in an international milieu while deepening your understanding of your own beliefs and values. In addition, you may earn a French-, German-, Japanese- or Spanish-language certificate that demonstrates intermediate-level proficiency. In an increasingly international society, your language studies will serve you well in virtually any career. Whether you work for a Fortune 500 company, a small business, a human-services organization or a school system, you’ll find ample opportunity to put your communication skills to work. The best way to develop fluency in a language is to study it in a country where it is spoken. As a language major, you’ll spend at least one semester studying abroad. For a teaching minor, you’ll complete at least six weeks of international-language immersion. In certain study-abroad programs, you can pair your studies with an overseas internship. On campus, Japan Club and Spanish Club can help you enrich your cultural and verbal fluency. As an experienced student, you might consider living in the college’s Spanish House, where you will routinely speak the language for a semester or a year. Your academic excellence in language study may earn you a spot in St. Norbert College’s chapter of Phi Sigma Iota. Membership in this national honor society is the highest U.S. academic honor for language study. Tom Conner has been recognized by the government of France as a chevalier (knight) in the Ordre des Palmes Academiques – the highest national order for distinguished figures in the world of culture. 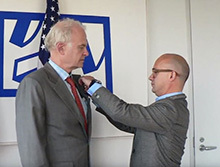 Conner’s knighthood recognizes the professor’s decades of service in promoting French language and culture in the United States, as well as for his pioneering work in Cambodia, a former French colony.